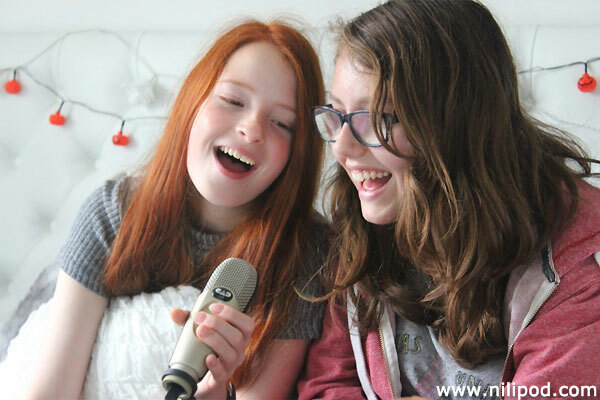 The photo shows us messing around and recording our podcast in Nia's bedroom with the new condenser microphone. We now have a plank of wood that stretches over the bed, which the microphone fits into, so that we don't have to hold it and it is easier to speak into. On top of the microphone we have a Monacor form windshield, which is designed to keep background noise in the studio to an absolute minimum. In front of the microphone we now have a flexible DBPower pop filter shield, to help eliminate any 'popping' sounds that are caused by accidentally blowing onto the mic when we speak loudly. It also helps to keep any 'spit' moisture off the microphone, thanks to its nylon stretched over the circular frame. A bendy arm allows the shield to be positioned in exactly the right place. We try our best to improve the sound quality, but it takes time, and unfortunately, a little bit of money as well.